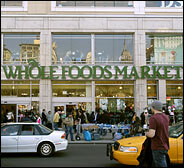 Tomorrow, January 16th, grab your shopping cart and head to the Whole Foods Market in Union Square or Chelsea. It's a good day to stock up, cause you'll be doing good at the checkout line. The gourmet market mega-chain is pledging that 5% of the day's net sales from both NYC locations will go to Convenant House.